It had been raining heavily in the entire trip to Bharatpur and risking the lens and body we went on shooting some beautiful birds. Our guide saw a pair of Sarus cranes flying some Kms away and we took the rikshaw all wet , somehow protecting the kit with plastic packs and got them. They are tallest of the flying birds, standing at a height of up to 1.8 m (5.9 ft).The Sarus Crane is easily distinguished from other cranes in the region by the overall grey colour and the contrasting red head and upper neck. 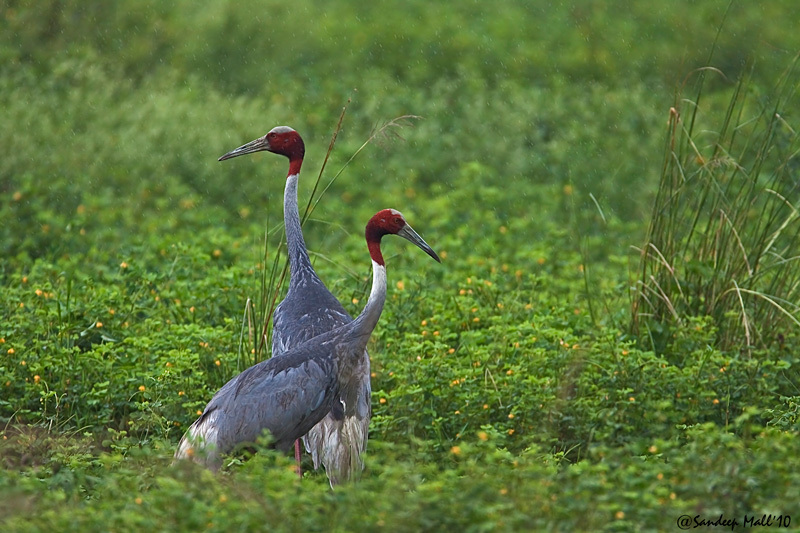 They forage on marshes and shallow wetlands for roots, tubers, insects, crustaceans and small vertebrate prey.The adult Sarus Crane is very large with grey wings and body; a bare red head and part of the upper neck; a greyish crown; and a long greenish-grey pointed bill. In flight, the long neck is held straight, unlike a that of an heron, which folds it back, and the black wing tips can be seen; the crane’s long pink legs trail behind them. This bird has a grey ear covert patch, an orange-red iris and a greenish-grey bill. Juveniles have a yellowish base to the bill and the brown-grey head is fully feathered. The species is venerated in India and legend has it that the poet Valmiki cursed a hunter for killing a Sarus Crane and was then inspired to write the epic Ramayana.